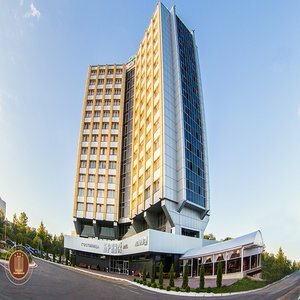 The Bryansk Hotel is located in the heart of the city of Bryansk. Founded in 1985, the hotel was completely remodeled in 2014. The location is also on walking distance to administration, objects of culture, health, sports. Main Train Station is located 6 kilometers from the hotel, which is no more than 15 minutes away by car or 30 minutes by public transport. Distance from the bus stop "Hotel Bryansk" to the building - 100 meters. The hotel offers 238 rooms of different categories and of complete sets, all rooms are designed in classic style. All rooms feature LCD TV, cable TV, mini-fridge, two single beds or one double bed, telephone, hair dryer, dressing table, bathroom, toiletries. The rooms of higher categories are equipped with: an electric kettle, air conditioning, microwave oven, mini-safe. The hotel offers a magnificent view of the central avenue of the city or waterfront Desna River. The same name restaurant located on the ground floor. The 24-hour "Bryansk" restaurant is designed in the English style, serves European and national cuisine. Restaurant capacity is 70 seats in the main hall and 30 seats on the summer terrace of the restaurant. Additional amenities and services include wireless Internet access throughout the hotel, a gym, a dental office, a souvenir shop, a beauty salon.